Broiling is a North American term, not really used or understood elsewhere in the world. It means cooking something directly under a very high heat source (what in the UK would be called grilling.) Originally, the heat source would have been gas elements; now, they may be electric instead. Broiling sears the outside of meat. It does not require any added fat, as say frying the meat in a pan might. For the purpose of this entry, the word “broil” will be used to denote cooking with the heat source on top. Broiling works not by heated air rising up and around food, but rather by radiant energy directly from the source of the heat on the item being cooked. Almost all ovens in the UK have a dedicated broiler compartment, though they call it a grill. This is generally above the oven, either right on top it, or at eye level. The eye-level ones are completely separate from the oven, attached at eye level to a tall stove back. They could be described as an open drawer (usually without a door) or compartment. Because they don’t usually have a door, they can look unsightly but they do get used a lot and obviate the need for any bending to see what is going on. The ones that are a separate drawer space on top the oven will be about waist height so that generally you can see what’s happening easily without the need to do deep knee bends. They have a door that you keep closed for tidiness sake, though the door is always to be left open while in use. In either design, inside the compartment, at the top, is the heat element. There’s a removable tray that you set under it, and there’s a rack you put in the tray. You put the object being broiled on the rack. The tray catches drippings. There is actually a temperature control for the heat of the broiling, though sometimes just a simple one such as low and high, sometimes with medium in between. Some let you only turn the right or left half of the heating element on, which is useful if you’re only doing one small item, as it is less wasteful of energy. British toast enthusiasts insist the best toast is made in broilers (aka grills to them), as opposed to in a toaster. Most gas ovens in North America have the broiler in a separate compartment underneath the oven, at floor level. This may explain why most people in North America with gas ovens never use their broiler at all — it involves deep-knee bends which must be done frequently as broiling progresses quickly. Consequently, these bottom broiler drawers are often dusty from lack of use. Putting the broiler in that spot makes the stoves cheaper to make because the same gas element at the bottom of the oven used for baking can be used for the broiling drawer underneath it. When the stove switch is set to oven, the flames come out the top of the element; when the switch is set to broil, the flames come out on the underside of the element. 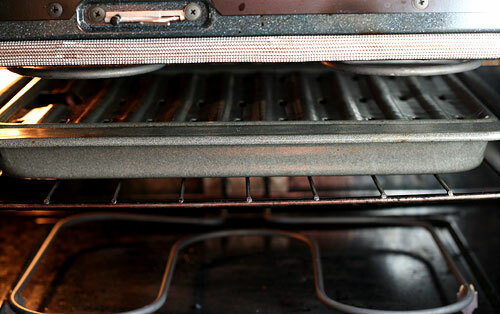 More expensive gas models in North America have a separate gas broiling element inside the top of the oven. In these models, there is usually clearance or storage space where the broiler would be on cheaper models. Some people don’t like the Broiling element inside the oven, because you can’t Broil anything while baking. On a few of the cheaper gas stoves, you can broil and bake at the same time. However, for most, you can’t anyway as you need to turn the dial to broil. Therefore you can broil or bake but not on the same appliance. Electric ovens in North American have a separate heating element inside them at the top, which comes on when “broil” is chosen on the oven dials. In some electric North American ovens, you can adjust the broiler temperature. You turn the broiler element on, and that turns on the top element instead of the bottom element. You then adjust the temperature with the normal temperature dial or buttons. In North America, it may be that as much if not more broiling (cooking with heat coming from on top) happens in speciality devices, such as toaster ovens. In North America, the food item being broiled is almost exclusively meat or fish. Broiling has fallen out of popularity in recent years, being displaced by the advent of backyard and countertop grills. While broiling does not require any added fat, as say frying in a pan might, but you may wish to brush some items with oil, such as fish. Add seasoning after cooking. Broilers do need to be heated in advance about 10 minutes. Take the pan out first, though. You don’t want it to get hot. Were it to get really hot, then the bottom side of your meat would start cooking right away, frying basically, and it’s not supposed to really cook until you flip it over to be exposed to the heat. Adjust the position of the rack before turning the broiler on. Allow at least 2 to 3 inches (5 to 7 1/2 cm), or whatever seems appropriate, to compensate for the height of the broiling pan plus what you are Broiling. If you allow only 4 inches (10 cm), and the pan with rack is 2 inches (5 cm), and you’re broiling a 1 inch (2 1/2 cm) chop (3 inches / 7 1/2 cm altogether, to make sure you’re following), then the surface of what you’re cooking would end up only 1 inch (2 1/2 cm) from the heat, which is too close. You want at least 2 inches, if not 3 inches (5 to 7 1/2 cm) for thin pieces (say 1 inch / 2.5 cm) of meat; thicker ones (say 3 inches / 7 1/ cm thick) should have a greater distance, with their surfaces at least 4 inches (10 cm) from the heat. When you flip the meat, you generally lower the rack a notch or two at the same time. Thin fish fillets generally don’t need to be flipped over, a broil on one side will do it. Flip thicker fish fillets. Well-done: 3 minutes per side, then finish off by lowering the rack a few notches, and cooking for an additional 5 to 10 minutes to taste. Remove the food when done. If you were broiling meat, cover it, and let stand for a few minutes for juices to get absorbed back in. “… ye shall fall into the well, and be broiled and brent, and sinke in the pitte of hell.”  “Boke of the Knight de la Tour” by Geoffroy de La Tour-Landry. William Caxton’s English printed Edition, 1484, translated from the original French “Livre du Chevalier de La Tour Landry pour l’enseignement de ses filles” (written 1371 and 1372). Fol/col 17/1. Thomas Wright edition, 1906 revision. London: Early English Text Society. 1906. Page 49. 1. ↑ “Boke of the Knight de la Tour” by Geoffroy de La Tour-Landry. William Caxton’s English printed Edition, 1484, translated from the original French “Livre du Chevalier de La Tour Landry pour l’enseignement de ses filles” (written 1371 and 1372). Fol/col 17/1. Thomas Wright edition, 1906 revision. London: Early English Text Society. 1906. Page 49.